Our 2018 Membership Directory, published locally by The Athens Messenger, is a wonderful resource. The Chamber receives a number of referral requests from the general public and refers only members to these potential customers. In March of each year, The Athens Messenger contacts Chamber members for the opportunity to advertise in the official Athens Area Chamber of Commerce Membership Directory. This publication also contains demographic information about Athens County and information about the Chamber of Commerce. 5,000 directories are printed in late spring and distributed throughout the year. Our Membership Directory’s are available at the Chamber office at 340 West State Street, Unit Suite 242. The Chamber’s official 2018 map is published locally by Chamber member, The Athens NEWS. This map is a beautiful resource and totally updated. Stop by the Chamber to pick up your copy. In February of each year, The Athens NEWS contacts Chamber members for the opportunity to advertise on the official Athens City/County Chamber map. A cooperative effort by the Athens Area Chamber of Commerce and The Athens NEWS, 17,000 of these maps are printed each May. 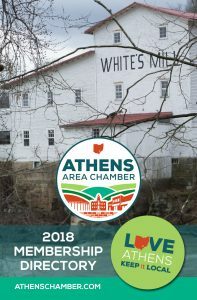 Athens City/County Chamber Maps may be picked up by visiting the Chamber office at 340 W. State St, Suite 242 in the Ohio University Innovation Center.